Weight Loss Program for Men “In a little under 12 weeks, I dropped 34 pounds and my strength is the highest I’ve ever known” - Drew L.
You are going to shred that extra fat/weight and look and feel amazing. So now you just need that perfect plan for fat/weight loss. Don’t waste time with weight loss plans that don’t give you optimal results. It would be great if you increased your lean muscle mass and got strong too, right? Let’s make it happen! “Newbie Stage” – They men who have never taken fitness and exercise seriously before”. “Comeback stage” – Those with training experience and who have had a certain level of fitness before and they want to get it back or even go to a higher level. Whatever your fitness level is or how much weight you need to lose, don’t get hung up on what you can’t do YET. With our weight loss coaching you can accomplish amazing results in possibly a shorter time than you think possible. 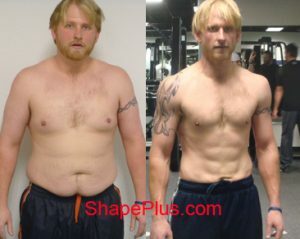 When your plan is to lose weight fast – specifically targeting body fat – Shape Plus will help you do it the right way. You will learn the tools to keep it off and have this thing in the bag for life. Your specific program as outlined in your MMAP® will favor training with the right amount Resistance Training, Circuit Training, Cardio Training, Core Training, Plyometric Exercises, Stretching and Nutrition to effectively obtain desired results based on your current fitness level, strength abilities, cardiovascular level and flexibility. Then let’s hit the gas and push you to the level you need to be, yet is still enjoyable to you. That place is different for everyone. Some people love to hurt and others not so much. Regardless, we are pushing your mental and physical pain threshold. We understand necessary versus being miserable. We want this to be the best hour of your day, not the worst. Losing weight too fast or not fast enough? If you don’t lose weight fast enough then you probably won’t stick with that program very long. You will lose interest, get caught up in not believing it’s going to work for you, and then think ‘why bother’, probably gaining back more weight only to do it all again. It is so hard to stick to an exercise program if you aren’t absolutely sure that what you are doing is definitely going to give you the results you want. In fact, why would you? The old adage “if you lose weight to fast then it won’t stay off and that weight will come right back plus more,” applies to those who do it incorrectly, i.e. – dieting, fasting, weight loss pills, etc.. So that adage has merit behind it, but it’s not because the weight came off to fast. It’s because you didn’t develop good and enjoyable habits and starved your body. So as soon as you start eating again or stop taking that weight loss pill all that weight comes back plus more. You CAN lose weight FAST and keep it off with our Shape Plus nutritional program and effective weight loss workouts for men. Plan on one hour workouts 2-3 times per week of circuit training and for best results add 2-3 additional cardio workouts in periods of 20-45 minutes depending on how aggressive you want to be in your weight loss. So plan on approximately 3-6 hours per week of exercise as life permits and how aggressive you want to lose weight. Mixing up those workouts is good for the mind and the body: Doing the same workouts day after day until they become a job can get boring. Then you just have more work to do either before you go to work or after you get off. Keeping workouts fresh will keep your mind engaged and the body guessing and that will make your body perform better and meet the challenges that you give it tomorrow. You can maintain your ideal weight through resistance training and nutrition, but to be truly healthy, incorporate only 20-30 minutes of cardiovascular training for heart health just 3 times per week. For most, we would like you to erase everything from your mind that you have ever heard, read or seen about fitness and nutrition and let us teach you our proven way. Our’s is the fast and healthy track for fat and weight loss plus you will learn everything you need to know to maintain your results. We aren’t trying to create a dependency, in fact we love to teach and we want you to learn. Most men appreciate that, but for those who don’t, no problem, you don’t have to learn anything except correct form for exercises which we will teach you, and the rest we will be very specific about and keep it simple so all you need to do is follow the weight loss program designed for you. *There’s no guarantee of specific results. 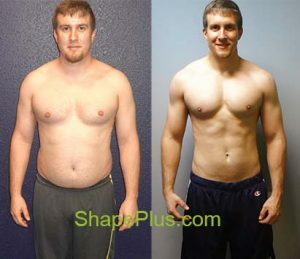 Contact Shape Plus to get more info about our Weight Loss Program For Men!